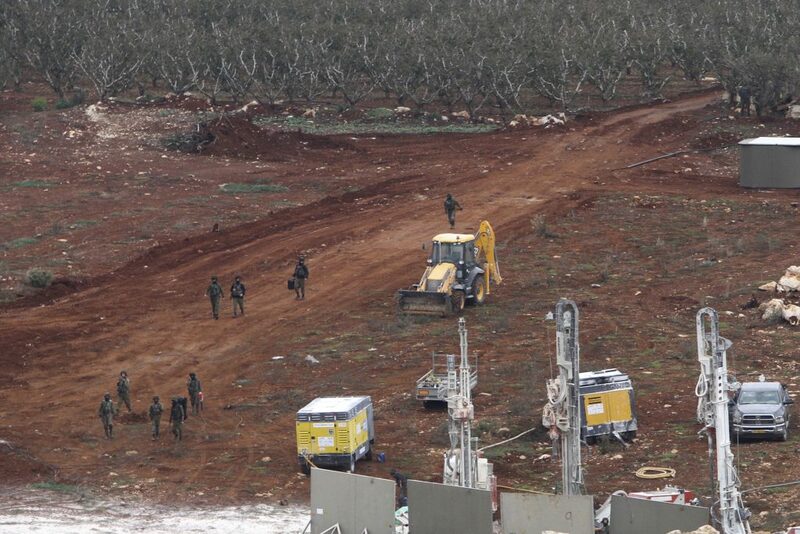 The Israeli military launched an open-ended operation Tuesday to destroy what it said was a network of attack tunnels built by Hezbollah, saying it had foiled a plot by the Iranian-backed terrorist group to carry out a deadly infiltration in northern Israel. Israeli forces did not enter Lebanese territory, and there was no immediate reaction from Hezbollah. But the Israeli announcement threatened to push the bitter enemies closer to an open confrontation for the first time since a bruising 2006 war. The military said it had protectively increased forces along the border and warned Hezbollah to keep its distance from the tunnels. The Israeli operation began shortly after PM Netanyahu returned from a surprise trip to Brussels to meet U.S. Secretary of State Mike Pompeo. Netanyahu said he had discussed the operation with Pompeo, and he planned to talk to other world leaders, including the U.N. secretary-general. Israeli military officials have long seen the northern front as the country’s most pressing security concern, with archenemy Iran entrenched in Syria and Hezbollah gaining strength in Lebanon. Hezbollah is believed to be far more powerful than in the monthlong 2006 war, in which it battled Israel to a stalemate. The group has gained valuable battlefield experience fighting alongside Iranian and Syrian troops in Syria’s civil war, and it is believed to possess an arsenal of 150,000 rockets and missiles capable of striking virtually anywhere in Israel. Lt. Col. Jonathan Conricus, an Israeli military spokesman, said the army has been tracking the Hezbollah tunnel project since 2014 and that Tuesday’s operation, codenamed “Northern Shield,” had been in the works for a year and a half. He said the tunnels were not yet operational. Standing alongside Netanyahu, Israeli military chief Lt. Gen. Gadi Eisenkot said the mission would last for several weeks. “The operation commenced because the threat posed by the tunnels became an immediate and direct threat to residents of the north and Israeli army bases,” he said. The army said the tunnel revealed Tuesday stretched some 200 meters (yards) from a home in the Lebanese village of Kafr Kela across the border and exited in farmland southwest of the pastoral Israeli border town of Metula. It said was outfitted with electricity, a ventilation pipe and a communications cable. Residents told Israeli media they had been hearing digging noises for years and had reported their suspicions to the military. Metula resident Michael Mazeika said he and others received texts early Tuesday from local officials informing them of the situation. People went about their daily routines, he said, and Israel gave them no special orders, signaling it was not expecting an immediate response from Hezbollah. Hezbollah is emerging from Syria’s civil war with thousands of its fighters killed and wounded and is averse to another military adventure with Israel. The group, however, is feeling empowered by what its leadership regards as a victory for their ally, President Bashar Assad, who has survived a seven-year war and revolt against his rule. The group is feeling increasingly emboldened internally in Lebanon, where it made significant gains in parliamentary elections in May. Hezbollah can also count on support from the Lebanese president, who is an ally, in case of confrontation with Israel. There was no immediate comment from Hezbollah. An official from the so-called “Axis of Resistance” — led by Iran and made up of Syrian officials, Iraqi Shiite militias, Hezbollah and other groups — said Hezbollah fighters were “on high alert to confront any possible Israeli aggression.” The official spoke on condition of anonymity because he was not authorized to discuss the group’s military activities with the media. The Lebanese military said the situation on its side of the border is “calm and stable,” adding that army units in the area were conducting their usual missions in coordination with U.N. peacekeepers. “The army command is ready to confront any emergency,” it said. Although Israel believes Hezbollah is in no rush to go to war, the army has been preparing for renewed hostilities for some time. Last year, it held a large-scale drill simulating war with Hezbollah. It also has reinforced a massive border wall and stepped up foot patrols on the border. Under the U.N. resolution that ended the 2006 war, Hezbollah is barred from operating in southern Lebanon. Israel has long accused it of violating the resolution. PM Netanyahu said he holds the Lebanese government responsible for Hezbollah’s actions. Israeli officials believe Hezbollah has long been preparing for an operation to shift the battlefield to Israeli territory. Conricus said the tunnels were meant to be a “surprise component” of that plan. The 2006 war began with a cross-border raid in which Hezbollah abducted two Israeli soldiers whose remains were returned two years later in a prisoner exchange. Hezbollah’s leader, Sheik Hassan Nasrallah, on several occasions has vowed to storm northern Israel. The border has been relatively quiet, but the sides have come into conflict in Syria, where Israel has carried out scores of airstrikes purportedly meant to prevent Iranian arms from reaching Hezbollah. Netanyahu recently has faced a major crisis in his governing coalition over the handling of a ceasefire with Gaza terrorists. Facing heavy criticism over the ceasefire, he cited Israel’s “complex” security situation, in what was seen as a reference to the north. Eisenkot, the military chief, said the Israeli Cabinet authorized the operation weeks ago, on Nov. 7.